The US military continues to respond to natural disasters with our medical, engineers, airlift and numerous other resources! We still have forces in Haiti and have responded to a request of Chile’s government for assistance there after their 8.8 magnitude earthquake and tsunami at the end of February. Our world wide “first responders” are busy and creating goodwill in nations that need help is a critical mission! The DoD Bloggers Roundtable talked with Air Force Colonel Byron Mathewson, commander of U.S. military forces deployed to Chile in support of earthquake relief operations today for an update on their efforts. He specifically addressed USAF C-130 relief support, a Navy Port Assessment Team, and USAF Expeditionary Medical Support operations. 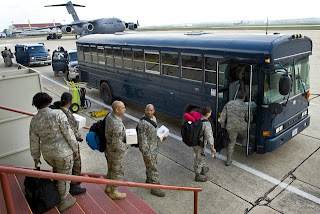 With approximately 150 total US military personnel in country in support of USAID (US Agency for International Development) they were in direct response to Chilean government requests for assistance. 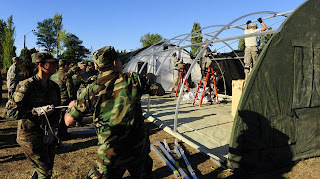 USAID is coordinating the overall US response with Chile and provided funding for a mobile military hospital. When Colonel Mathewson said the two C-130s that were sent by US Southern Command were part of “Coronet Oak” it brought back memories of an assignment long ago at Howard AB, Panama where rotational Guard and Reserve units supported the Central and South American mission while at Howard. I believe the same effort continues (30+ years) to support this effort from Puerto Rico where the units were relocated after Howard was closed. Continuing this long history of humanitarian aid and support to the Americas they flew 17 sorties, 37.5 hours, lifted 66 pallets and moved 300,000 pounds from Santiago, the capital, to Concepcion, an area devastated by the earthquake. The Air Force medical teams were placed even further south with a 3.5 hour drive from Concepcion. The aircrews have also completed one medevac mission moving a severely injured person to Santiago. The aircraft that were deployed are from Niagara Falls Air Reserve Station and the crews are from St Joe, Missouri! Super cooperation to help the folks surviving a terrible natural disaster! The Chilean government request for a port assessment team from the Navy was due to damages to a shipyard from the tsunami created by the earthquake. The 12 sailors sent to help included divers, medical and other specialists. The team arrived March 8th and left this past weekend after providing their assessment. The medical teams arrived on the 9th of March and built the mobile hospital in 3.5 days after the local clinic was so damaged by the earthquake it was unusable. The clinic serves a population of 110,000 Chileans with 60 Air Force and 50 Chilean medics manning the facility in full cooperation. The medical teams are from 16 US locations and are a mix of active, reserve and guard forces! Quite an effort to pull the team together that fast and coordinate their response! When the medical personnel depart on March 26th they will leave the mobile hospital in place for the use of the Chilean medics who lost their clinic! Col Mathewson said the response from the Chileans has been heartfelt with shows of appreciation such as horn honking and thumbs up from the people on the street to Americans in uniform! Wow! Thank you and much appreciated from this retiree who supported many rescue and humanitarian missions worldwide. There is nothing better than a smile from someone you are helping! You can feel the appreciation even if you can not understand what they are saying! If you would like to hear the audio of this Roundtable or view a transcript please go to DoDLive! I received the following update from Col Mathewson after I posted the original blog! Thank you Colonel! I have not been to Angol yet, but it has been clear to me how thankful the people of that city are for EMEDS. For example, Col Garrison, the EMEDS commander told me yesterday that each day the local people are bringing large baskets of locally grown fruit and tomatoes to show their thankfulness. He said it is one thing to hear thank you, but quite another to see people sharing their food to demonstrate it. Another story which Col Garrison shared was of a patient that had a large gall stone removed. This man had been evaluated prior to the earthquake and was prepared for surgery but when the earthquake hit, surgery was obviously not available due to destruction of the hospital. When he had the surgery in the EMEDS it was found that he had a gall stone the size of a golf ball. When the Minister of Health came by to tour the facility this man and his family were "glowing with praise" for what EMEDS had done."